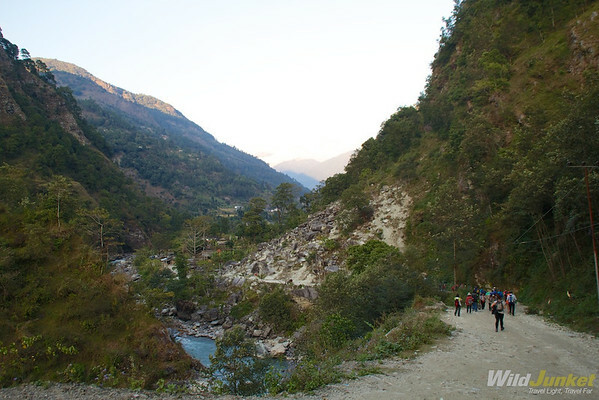 It’s almost late evening by the time we arrive in Nayapul, the starting point of the Annapurna Foothills Trek. After a hectic eight-hour drive from Kathmandu, we have dodged the random fires and riots of election day in Nepal and made it safely to the Himalayas. But now that we’re here, the sky is painted with flashing rays of purple and vermillion light and the sun is slowly setting beyond the horizon. Rugged trekkers adorning scruffy fleeces and worn-out hiking sticks flash us wide grins as they walk past us. “Enjoy the trek,” the hikers call out to us as they reach the end of the trek and head back into civilization. The group of French hikers look exhausted but they’re all beaming with an infectious sense of joy. Our first day on the trek is about to begin and it’s starting to get real. I begin to feel my excitement growing alongside my nerves. Granted, I’ve done many multi-day treks in life, this can’t be too much of a challenge — or can it? There’s only one way to find out. Ready or not, it’s time to hit the trail. This is the Himalayas, home to the planet’s highest peaks (including the highest, Mount Everest) and some of the maximum, remotest, and most rugged and difficult trekking terrains in the world. 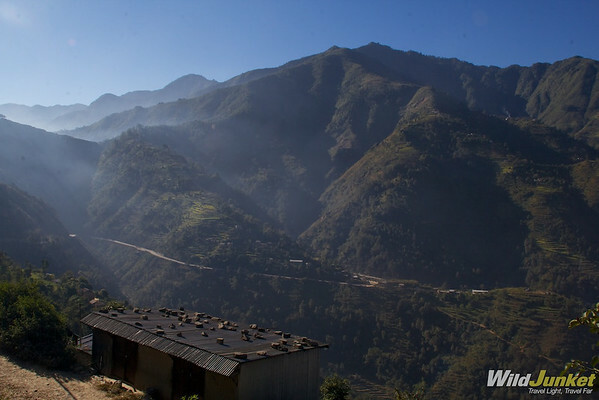 This massive mountain range covers three quarters of Nepal, making it one of the best destination for trekkers. Numerous treks criss cross the Himalayas, but arguably the most popular routes are the Annapurna Circuit Trek and the Everest Base Camp Trek. Both of which reach up to altitudes of over 5,000m and take an average of 25 days to complete. 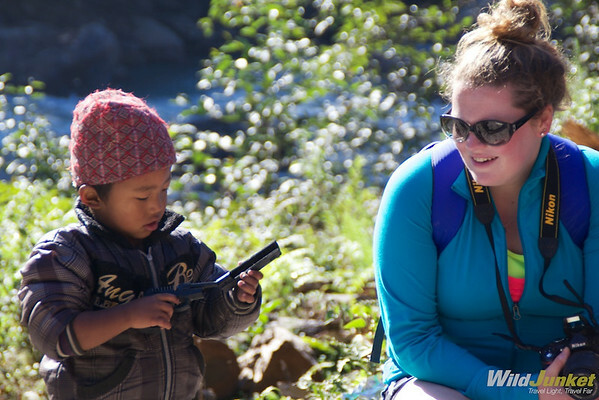 Sadly I don’t have the time (nor the fitness level) and so I opt for the four-day Annapurna Foothills Trek as part of my G Adventures Nepal Adventure tour. With 16 peaks over 6,000m (19,690 ft), Annapurna is a section of the Himalayas in north-central Nepal famous for its magnificent panoramas, rugged scenery and isolated mountain communities. 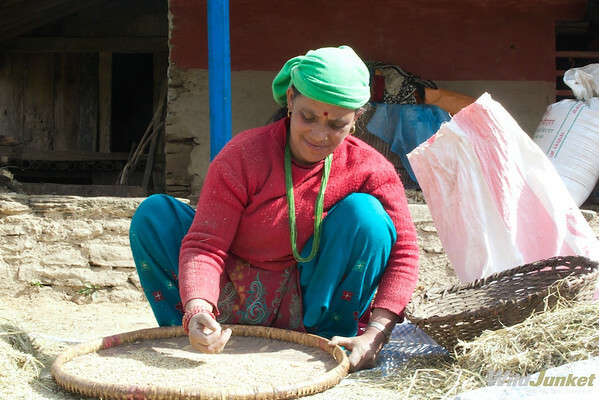 Even though we’ll barely reach the mid-section of Annapurna, we will be weaving our way through the rice paddies and pastures of the foothills, visiting isolated mountain communities and observing different ancestral customs and traditions — this promises to not only be a visually superb expedition but also a culturally rich one. With 16 peaks over 6,000m (19,690 ft), Annapurna is a section of the Himalayas in north-central Nepal famous for its magnificent panoramas, rugged scenery and isolated mountain communities. When we finally leave Nayapul on our first evening, everyone in the group is exploding with excitement. We are all trotting along at a fast pace, whisking through villages, hopping over running streams and climbing gradually up the gentle slopes. The first part of the trail is surprisingly busy and populated — clusters of wooden houses flank the trail, with temples and monasteries in the far distance. Warm and welcoming local women pop out of their houses to say hi while children play on the sidewalk. In the village, we follow a steep trail made out of flat rocks stacked together to form a stairway. We wind past concrete huts and tin-roofed shacks, with lush green banana trees and thickets of bushes grow wildly around it. Once we leave civilization behind though, the trail starts to flatten out and morph into a wide, dusty gravel road that runs alongside a water channel that seems to trundle down somewhere deep in the mountains. It looks as though we are finally heading into the mountains. 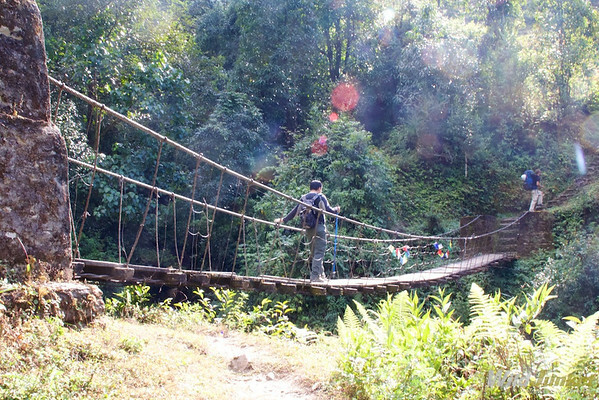 After only an hour and a half, we cross a swinging rope bridge and come to a tiny village called Birithati. We’ve only gone 1.9 miles (3km) so far, but our guide BK announces that we’ll be sleeping in a teahouse here for the night. Slightly disappointed, we all want to continue; but even the gods tell us it’s time to stop as the sky darkens and the temperature drops. By the end of dinner, my new group of friends are swapping stories, laughing and joking like we had known one another for years. I find myself surrounded by a great mixture of interesting characters from different walks of life: a hilarious American lacrosse instructor who spin the globe and came to Nepal by chance, a pair of doctor buddies, a group of three Aussie young nurses, a family from Belgium, and so on. Just when I think it’s time for bed, our porters pull out their musical instruments and the tranquility of the night is suddenly replaced by infectious folklore music. Even BK breaks into traditional dance and drags us up to the center of the dining hall with him. Our first night on the trek ends with a comforting stream of laughter and warmth. Before the sun even has a chance to peek its head over the mountains, I am wide awake. The first thing I see when I open my windows is the looming mountain, standing high and mighty before us. The sky over Birithati is tinged with a pre-dawn glow, outlining the silhouette of the mountains around us. The hike ahead of us today is going to be long one. We are just slightly above 3,543 feet (1,080m) above sea level and Ghandruk, our destination, sits at 6,300 feet (1,920 meters), which means we’ll have to scale around 2,950 feet more (900m) in just one day. Two hours later, we round a bend and find an outrageous view of Mount Machhapuchre, a mountain so holy that it’s off limits to climbing. 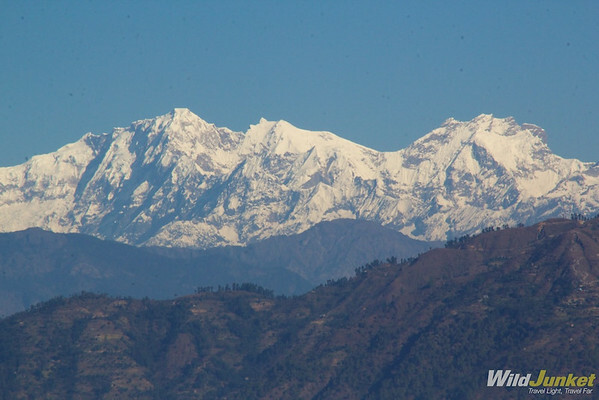 Its double summit resembles the tail of a fish, hence the name meaning “Fish’s Tail” in Nepali language. Machapuchare has never been climbed to its summit. The only attempt was in 1957 by a British team who climbed to within 50 m of the summit, but did not complete the ascent; they had promised not to set foot on the actual summit. Since then, the mountain has been declared sacred, and it is now forbidden to climbers. By this time, the sun is already high above our heads. We peel off our layers of fleeces, leaving our t-shirts on, and bask in the glorious sunshine. 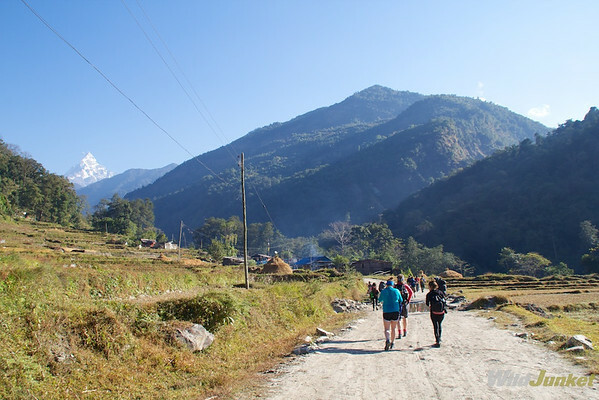 Our walk continues up a gradual uphill slope, with the Machhapuchre mountain guiding us like a lighthouse. To make sure I’m not exerting too much on the first day of our trek, I make sure to keep to a slow and comfortable pace, making regular stops and chatting along the way. Two hours later, we round a bend and find an outrageous view of Mount Machhapuchre, a mountain so holy that it’s off limits to climbing. 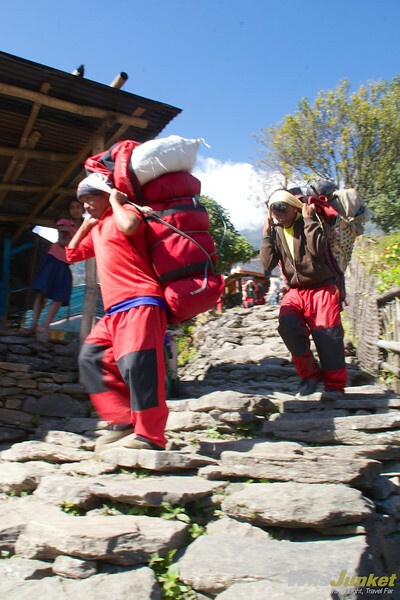 What follows is two hours of grueling stair-climbing as I huff and puff up the trail whilst porters race past us. The climb is brutal but it’s the feeling of pushing my body and my mental strength that keeps me going. The higher we climb, the harder it seems to get — maybe it’s because of the altitude, perhaps it’s the heat, but no matter what, I know I have to keep going. Once in awhile, I remind myself to look back and take in the beauty. It’s not everyday that I get to see such impressive landscapes from a vantage point like this. The stunning gorge plunges vertically beneath us, blending seamlessly into the emerald waters of the raging Modi Khola river which flows from north to south between the Annapurna and Machhapuchre mountain ranges. 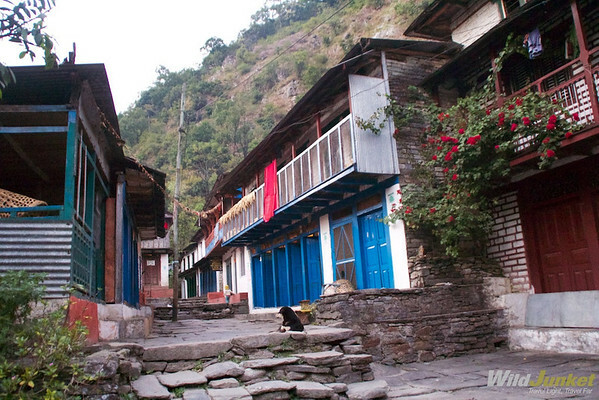 Panoramic views of Ghandruk begins amid networks of terraced farmland leading to the beautiful slate roofed village houses bordered by spectacular rhododendron forest to the west. By the time we reach our lunch spot, Kimche, the river and farmlands are so far beneath us that I can’t help but feel a sense of achievement. It’s not everyday that I get to see such impressive landscapes from a vantage point like this. The stunning gorge plunges vertically beneath us, blending seamlessly into the emerald waters of the raging Modi Khola river which flows from north to south between the Annapurna and Machhapuchre mountain ranges. Disclaimer: I traveled to Nepal with G Adventures as one of their Wanderers in Residence, but as always, all opinions expressed above are our own. 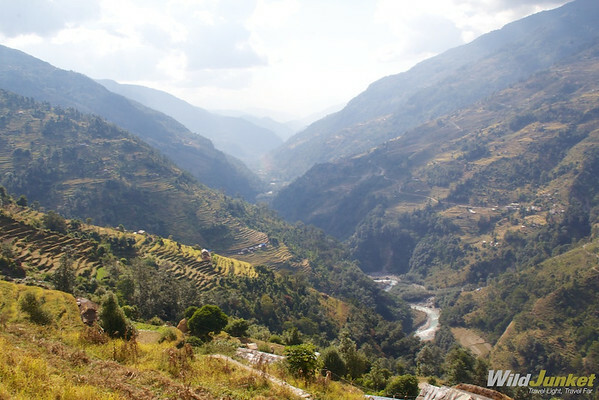 The post Annapurna Foothills Trek — Part I: A Walk in the Clouds appeared first on Wild Junket.